We had another fantastic afternoon! 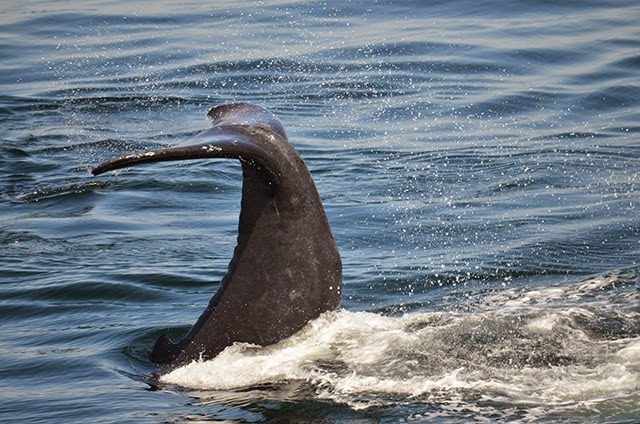 On our first trip aboard the Asteria, we headed to the SW corner find about 10-15 humpbacks scattering throughout the area, while several fin whales also passed through. 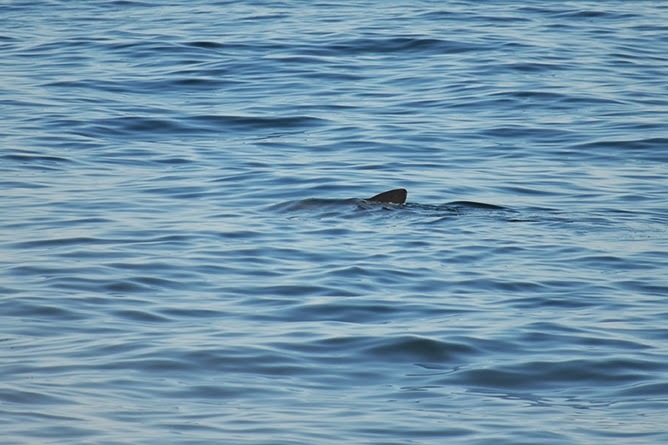 We first passed by a basking shark (see photo) – but with all the whale activity we quickly moved past. We came up on Osprey subsurface bubble cloud feeding, while observing some kickfeeders and bubble nets in the distance. We left Osprey to head toward the kick feeders – where we found two groups – Springboard was kicking solo, while Glo-Stick, her calf, and Jabiru (who kept splitting and joining) were feeding together on the other side of our boat – either way you looked you had a great display of feeding! 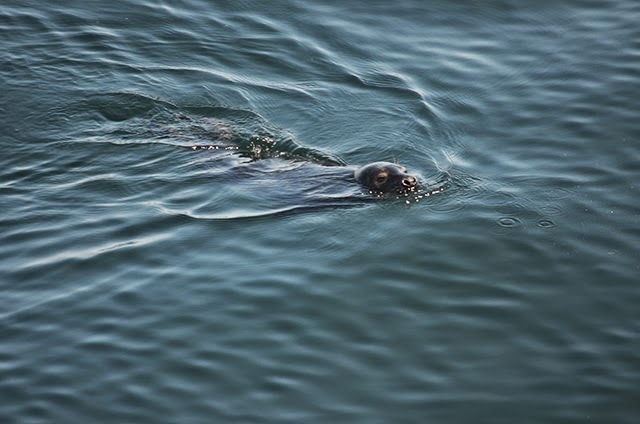 A small grey seal also came up to check us out as well. Milkweed and calf also made an appearance but did not join the group, and we ended up the trip with Glo-Stick and Jabiru traveling together while Glo-Sticks calf gave us a good-bye look of some tail-lobbing! (see photo up top). 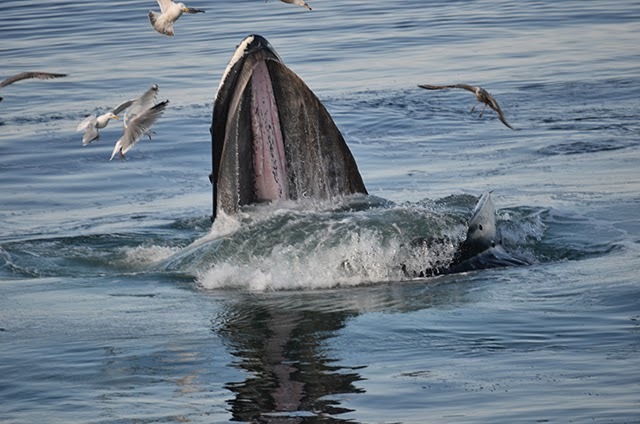 We had a five species trip of 10-15 humpbacks, 4-6 fin whales, 4-5 minkes, 3 grey seals, and a basking shark! I also spotted an Iceland gull in the mix today. On our 4pm sunset trip, we were treated to glass calm seas and the bank to ourselves. We arrived first to find Grackle traveling alone, while fin whales and minkes were also close by. 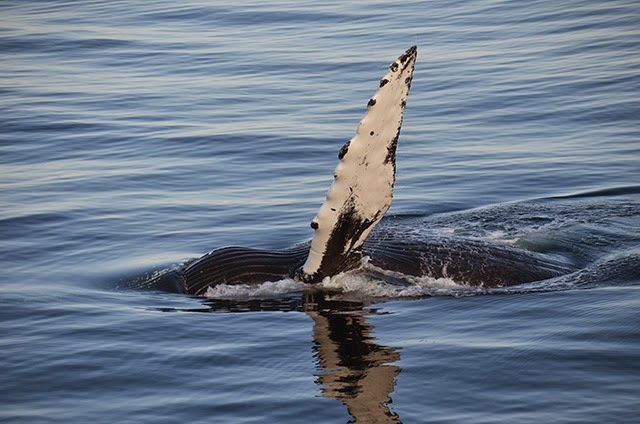 At one point – we had a fin, humpback, and minke all in one sight! 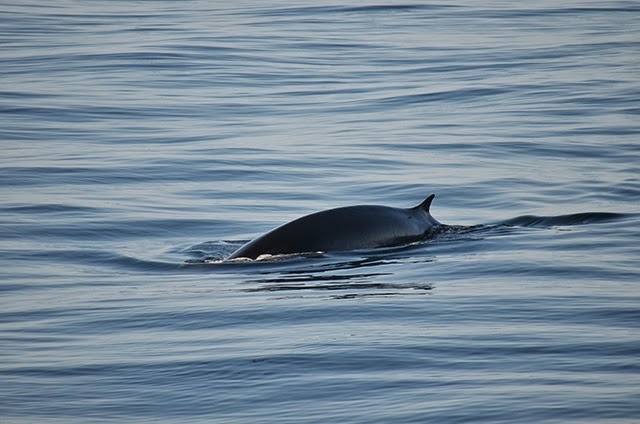 We kept moving south in the scattered activity – finding 7 fin whales subsurface feeding in the area, several in pairs. It was exciting to see so many fins at once, and with the conditions, we could really appreciate their size. 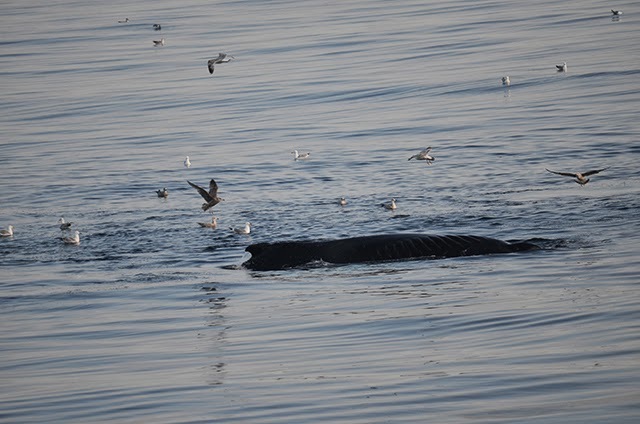 Past the fin whales, we could see the blows of all the humpbacks – including a breaching calf in the distance (Nile’s calf!) and Echo kick feeding while her calf tail-breached near her. We came up to Nile and her calf, who surprised us with a few sporadic full breaches (unfortunately I missed a good breach photo while getting shots of Echo’s calf fluke – but it was a spectacular sight! ), while Nile fed subsurfacely. Rapier joined the group briefly, and then stole the show by flipper slapping repeatedly! She then began kick feeding, and surprised us again with a HUGE open mouth full of sand lance. Passengers looking alongside the boat could see huge schools of sand lance right under the surface. We ended the trip observing Pleats (displaying its large propeller scar ), in a feeding aggregation with Jabiru, Echo and calf. 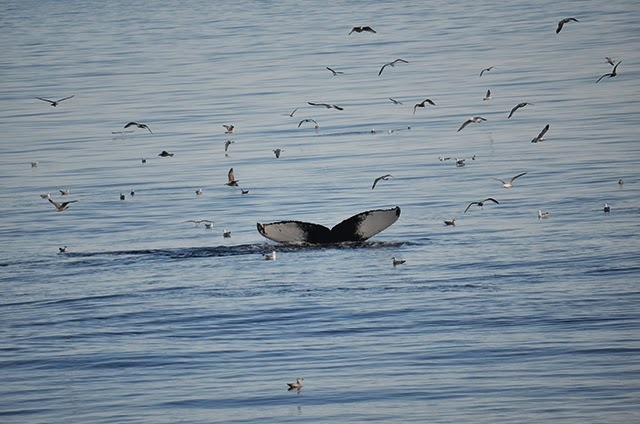 A total of 11 humpback IDs, 7 fin whales, 2 Minkes, and 2 harbor seals for the trip.